i dont understand! was there any episode where they were together at all? i hope not!! WHAT THE HECK!!! maybe its because they just r dumb au maybe they just want Trixie with somebody. That's a thing? ........................ How?! How and Why?! I had no knowledge of this until now. Okay. The episodes of Ponies On The Rails, and Gran Turismo featuring your OC as a special guest nyota have been completed. Not in any episodes, but in shabiki art, and shabiki fiction, and stuff like that. 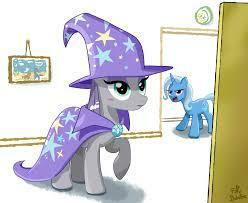 Well, Trixie did say she had to work at a rock farm to get enough money for the evil Alicorn Amulet. She had to be taken care of with a little bit of company. And since the Pie family is quite hospitable, why not have Trixie meet up with Maud? Why not put them together, despite being opposites? I don't think anyone ships them together. People can ship anything they want...? And nobody is "dumb" because of it. wewe seem to be young, but please learn to respect other peoples opinions.